STERLING CITY, Texas, Oct. 11, 2018 /PRNewswire/ -- Knowing it was time for a new voting system, Sterling County Commissioners and Elections Department selected Verity® Voting from trusted election solution provider, Hart InterCivic. The County's new equipment arrived last week, and training is in progress. "Hart is great to work with," said Election Clerk Stacie Denton. "This is my first year in elections. I started here last October and jumped right into the November election. People don't realize all the work that goes into an election! Hart has been so helpful – they came out to help with our election last year, and they'll be with us for this election. Our trainer for the new system is extremely knowledgeable. We're ready to get started." "Our equipment was 13 years old. We got a lot of years out of it, but it was definitely time to replace it," Denton continued. "This new Verity system will be good for Sterling County. We love it; it's much simpler. And the Verity units are half the size of our old equipment. Everything is smaller and more compact." Sterling County voters will be invited to preview the new system beforeEarly Voting begins October 22. "Our voters will like the touchscreen," said Denton. "We've had comments – even from the older voters – asking when we were going to go to a touchscreen. Keeping the community happy and taking care of our voters is what we're here for." 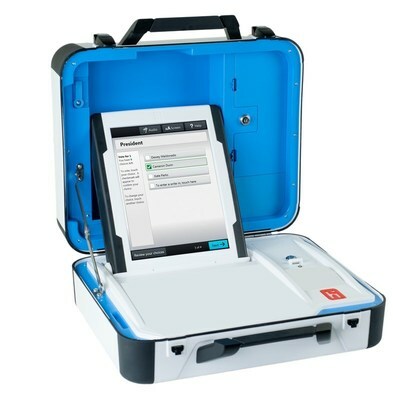 "We understand Texas counties have a choice when it comes to purchasing a new voting system," said Phillip Braithwaite, President and CEO of Hart InterCivic, an Austin-based company with more than 100 years of experience providing election solutions. "Verity is the best choice; it is newly designed to be the most secure and easiest-to-use system. We appreciate Sterling County's forward-looking choice of Verity, and we look forward to supporting successful elections in the County well into the future." Sterling County joins a growing number of Texas jurisdictions moving to Verity. Since the Texas Secretary of State certified the latest release of the Texas-built system in late 2016, Hart has shipped more than 8,000 Verity devices across the State. First federally certified in 2015, the secure and efficient system is also in use in numerous counties throughout the U.S.
Braithwaite expects more announcements as additional jurisdictions choose Verity to refresh their election technology. Austin-based Hart InterCivic is a full-service election solutions innovator, partnering with state and local governments to deliver secure, accurate and reliable elections. Working side-by-side with election professionals for more than 100 years, Hart is committed to helping advance democracy one election at a time. Hart's mission fuels its passionate customer focus and a continuous drive for technological innovation. The company's new Verity Voting system makes voting more straightforward, equitable and accessible—and makes managing elections more transparent, more efficient and easier. Only Hart offers a completely new, secure voting system with electronic, paper and hybrid options.